If you follow me around the web you may have already seen these cards. 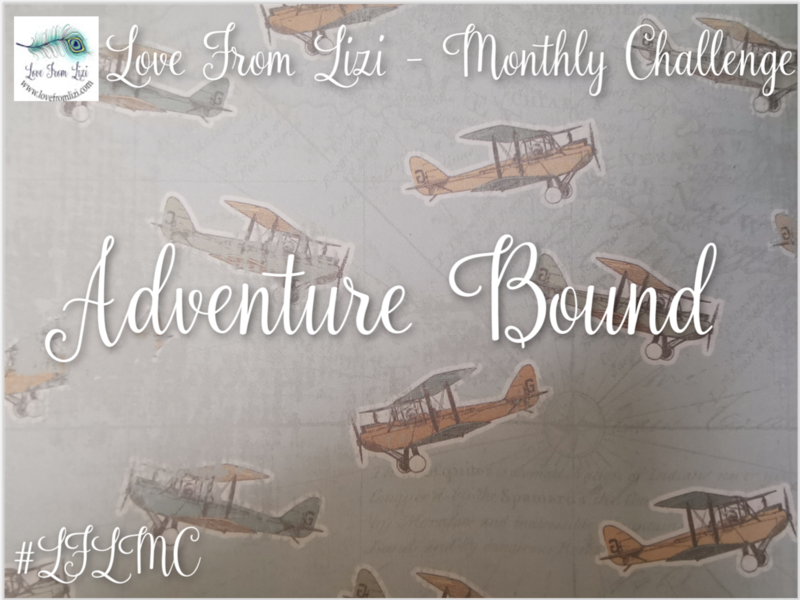 I was lucky enough to be asked to guest design for Love From Lizi this month, and excitedly agreed. Of course, I’d completely forgotten I’d be out of the country for several days around the time the video would need to go live! Luckily I was able to get it onto the LFL YouTube channel just before the deadline, but with how busy I was I didn’t manage to get it on my channel until yesterday, and am only just now managing to finish my blog post! 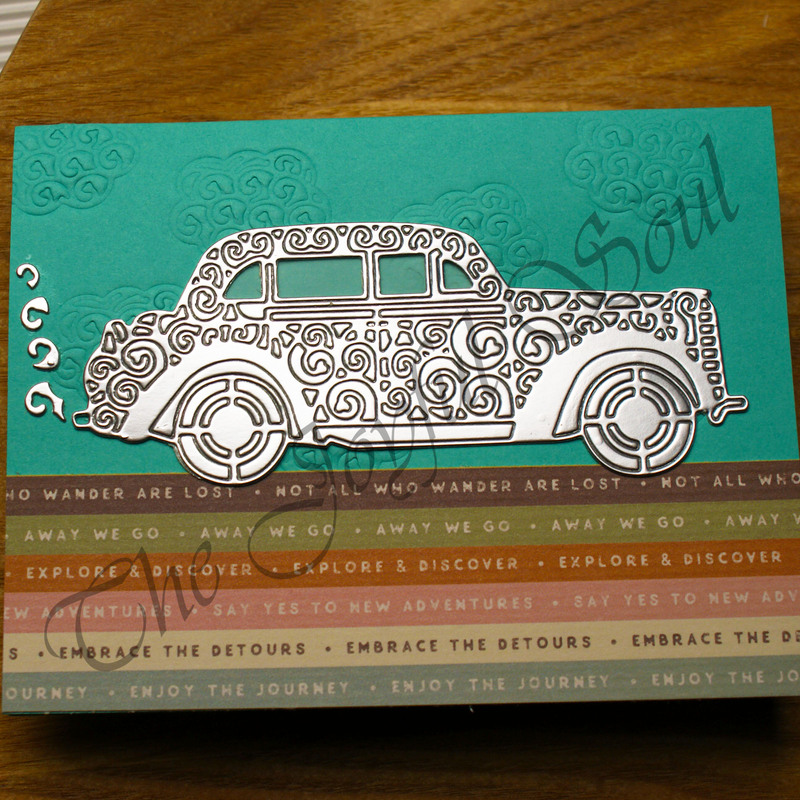 For my first card I wanted to use one of the patterned papers as the focus. I trimmed the map patterned paper to be just smaller than my card base. I also cut a strip of the word patterned paper to add a sentiment strip across the panel. I then took the wooden aeroplane embellishment and white heat embossed it. I adhered the papers to my card base and added the embellishment. 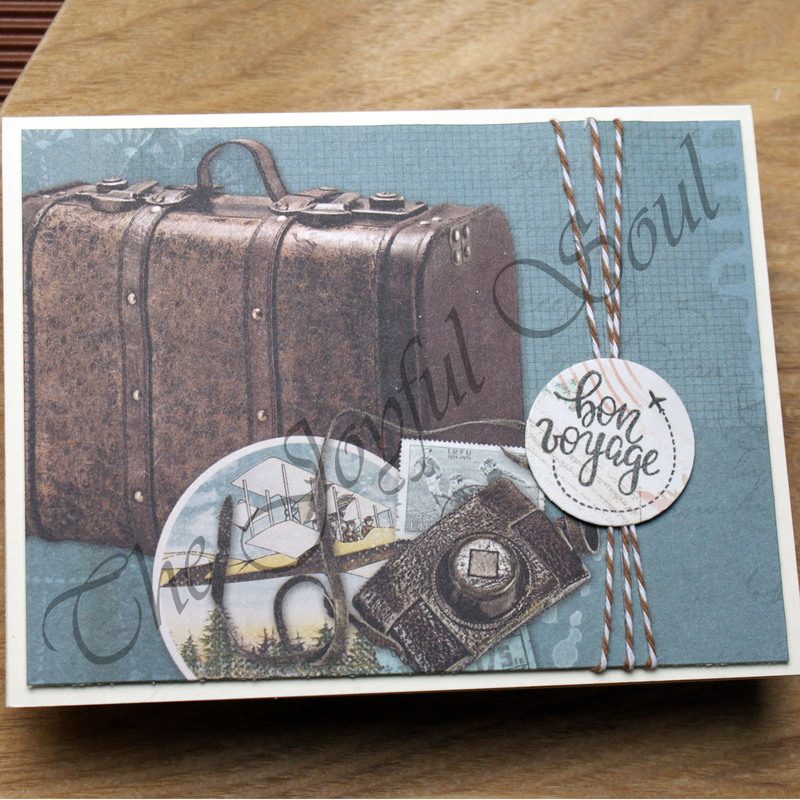 I then finished off the card using some of the Bon Voyage sequins. My second card also used a patterned paper as the starting point. I trimmed it down to be just smaller than my card base, then wrapped the narrow brown and white twine around it. I die cut a circle from a patterned paper snippet and used one of the stamps from the Bon Voyage stamp set to add my sentiment. I popped the sentiment up on foam tape over the twine, than added the patterned paper panel to the card base also on foam tape. I turned to the sticker sheet as my inspiration for my third card. 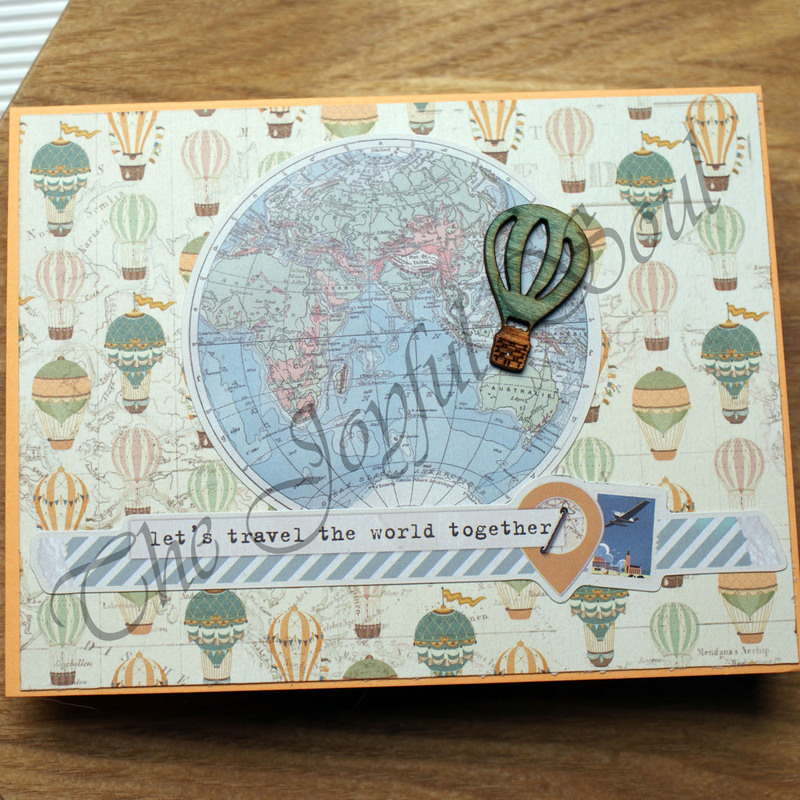 I chose to use the large globe sticker and also a sentiment sticker. I initially intended to put them directly on to my card base, but I wasn’t entirely happy with how it looked so instead I used one of the other patterned papers to create my background panel. 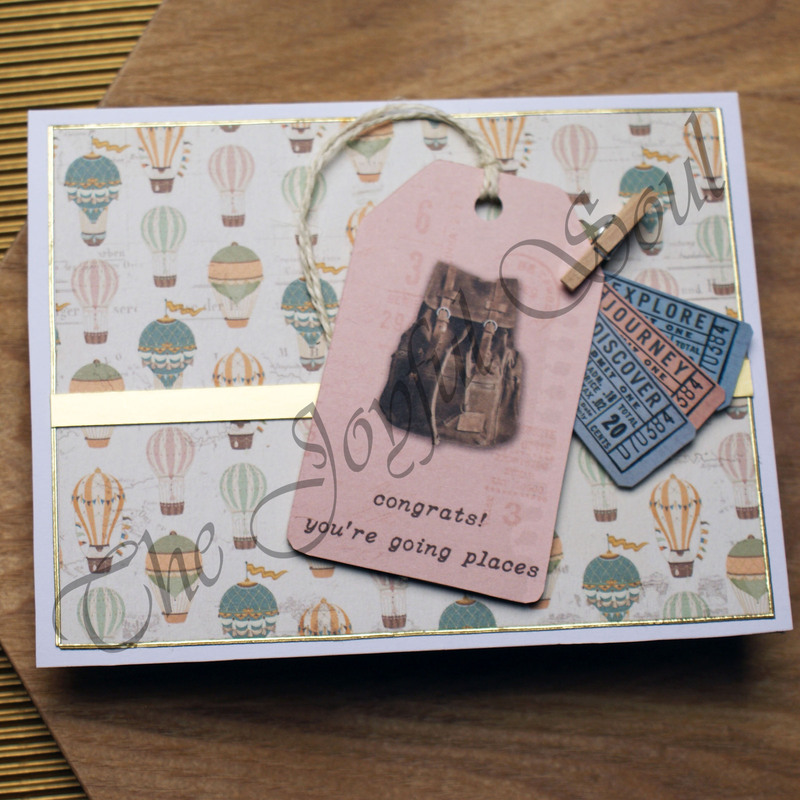 I chose the balloon paper and added it to my card base before topping it with my stickers. I also decided to add the wooden balloon embellishment. Rather than heat embossing it I chose to colour it with my alcohol markers. I then adhered it into place. For my fourth card I wanted to feature one of the fantastic for cuts that came in the kit. I cut the car from the silver mirror card, leaving all the intricate pieces in place other than the window pieces. I adhered a piece of vellum behind the windows. I then set the die aside and worked on the rest of my card. 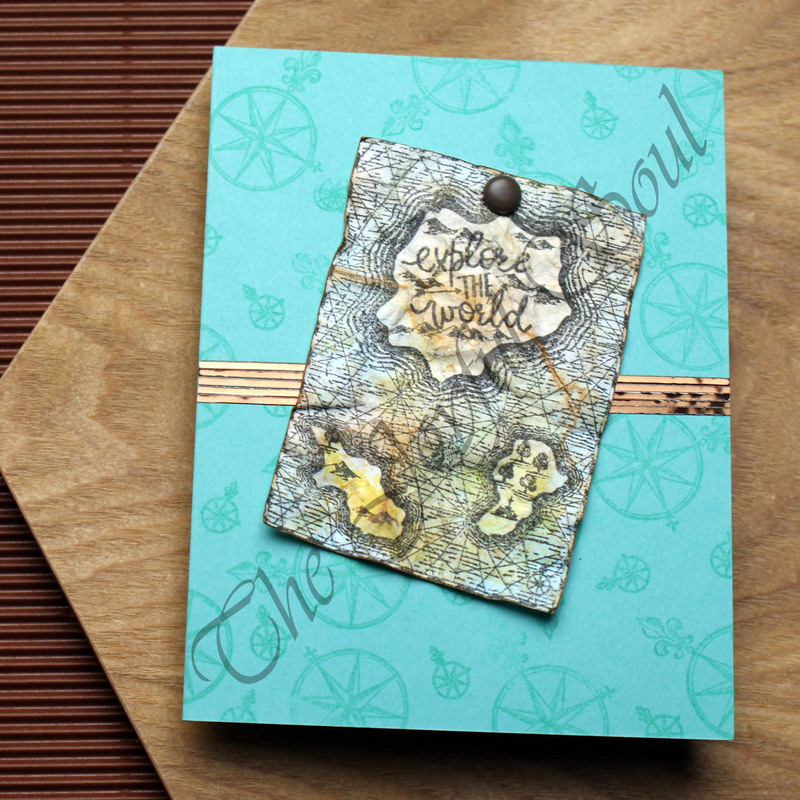 First I embossed clouds across the background of the card using the cloud die. I then used the sentiment strip patterned paper to create the ground of my scene. I adhered those into place and added the die cut car over the top. I felt there was still something missing so I used some of the negative pieces of the cloud die to give the impression of smoke puffs coming from the exhaust of the car. 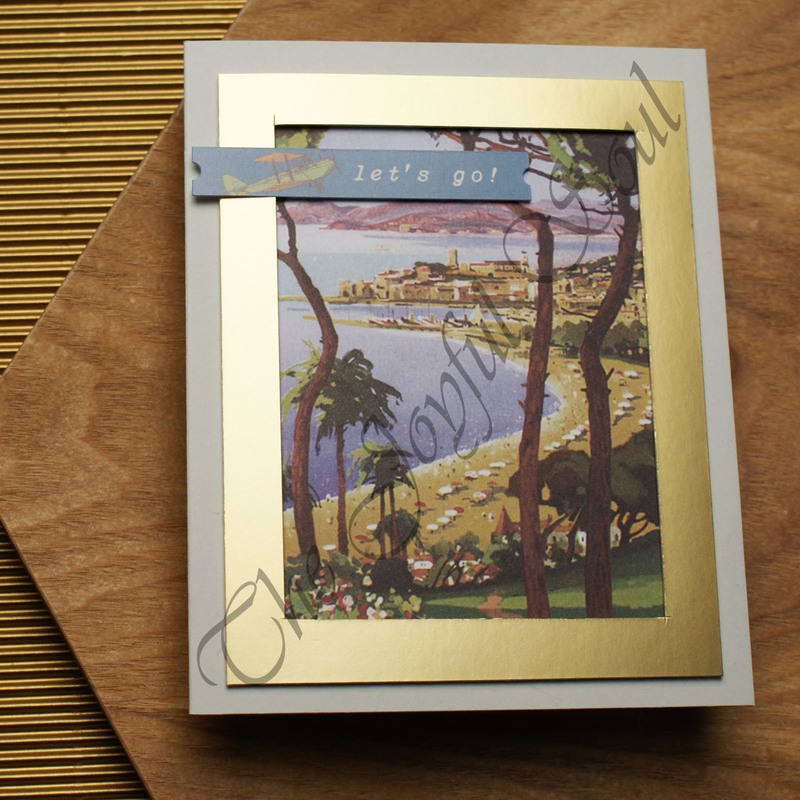 My fifth card was entirely inspired by the view on one of the cut aparts. I decided to make a simple window with it. I cut a frame from gold card and adhered that with foam tape over the cut apart which I had adhered flat to the card base. I finished the card by adding a sentiment sticker. I decided to heat emboss another wooden embellishment for card six. 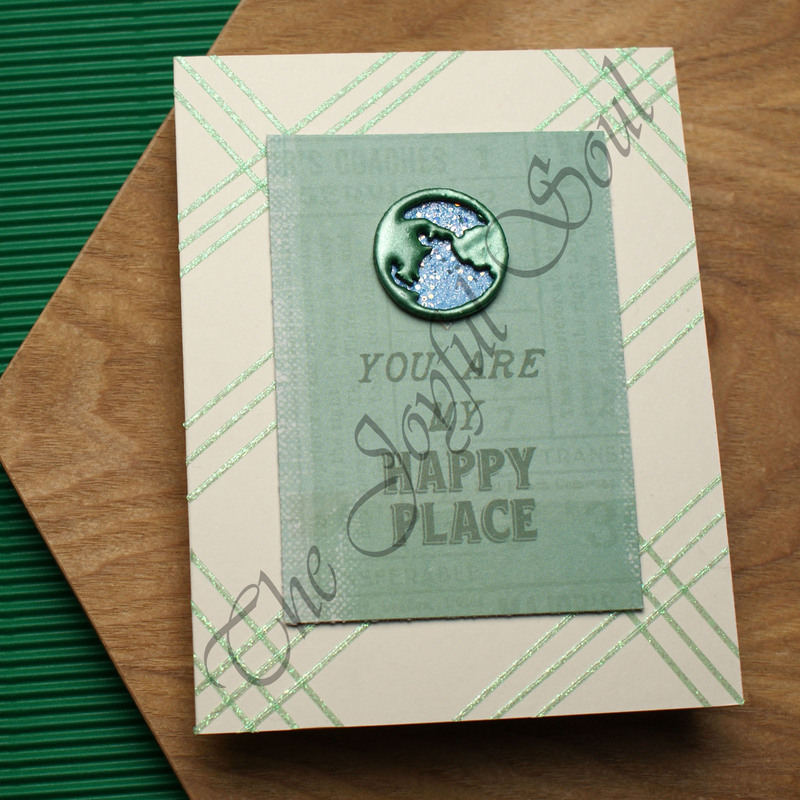 I used Emerald City embossing powder to cover the wooden globe or world embellishment. I then made a background for it with a white die cut snippet which I embossed with Baby Blue Party. I adhered the two pieces together and attached them to my chosen focal cut apart. For the card base I added decoration with the green iridescent glitter peel offs in a plaid pattern. I then popped up the cut apart over the background. My starting point for card seven was adding a cut apart to a tag. I used double sided tape to adhere the paper to my tag holding it up to the light to check the position. I then fussy cut around it and used a hole punch to add the hole back to the top of the tag. I used my anti-static powder tool to remove the sticky from the ticket stickers and attached three of them to the edge of my tag using one of the little wooden pegs. For my background I added a panel of balloon patterned paper to a white card base, edged with gold mirror peel offs, and added s snippet strip of gold mirror card across the centre. I then used a double layer of foam tape to add my tag topper to the card. I used wave and hill does to create the background for my eighth card. I used the yellow striped paper for the hill and blue for the waves. I adhered the waves such that the stripes all lined up. 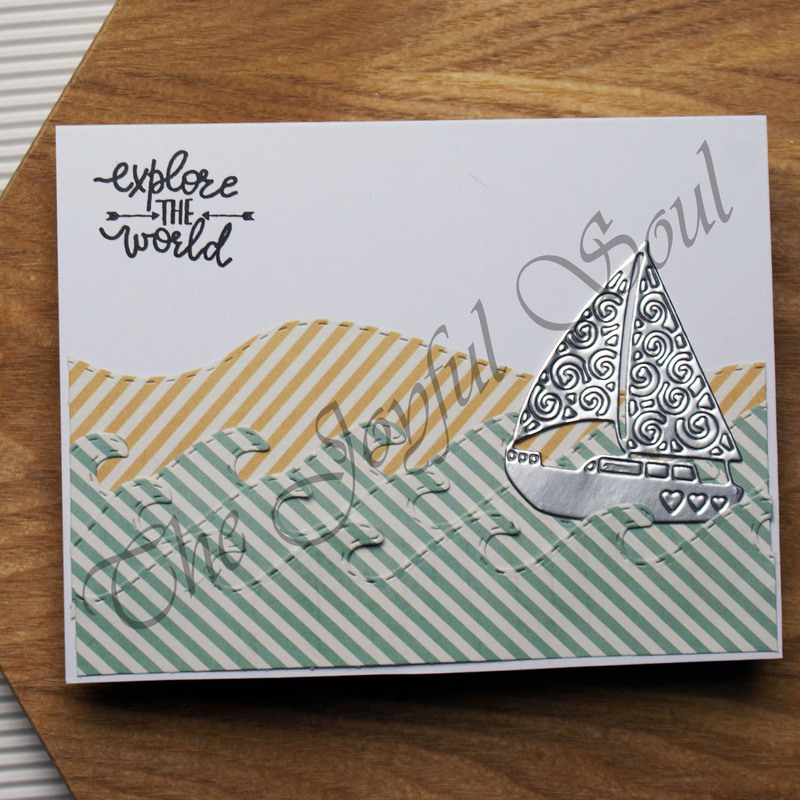 I then added a boat die cut from the silver mirror card, which I tucked behind the front waves. Finally I stamped on a sentiment. 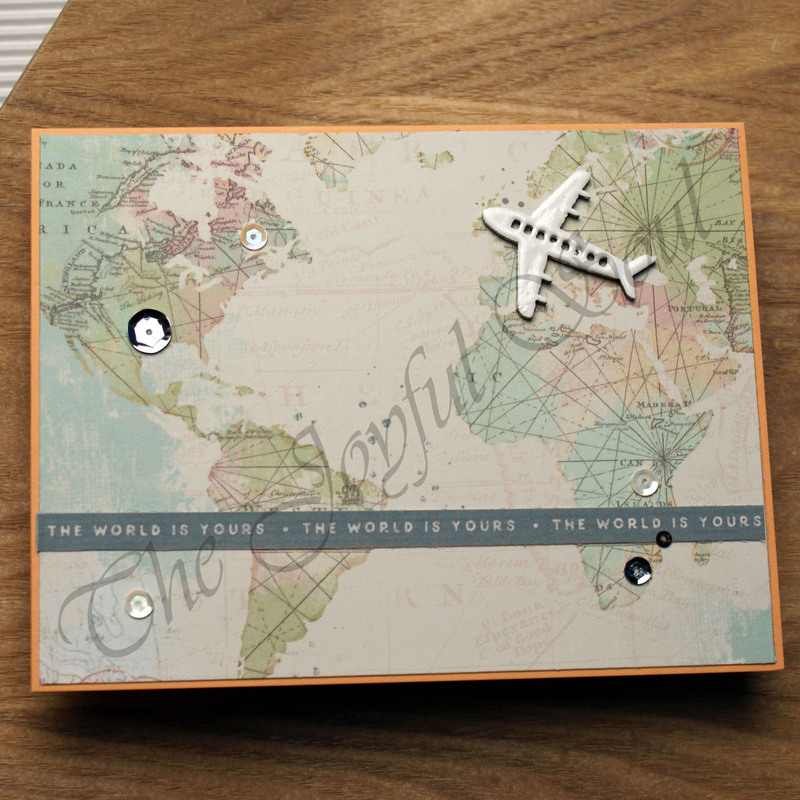 I really wanted to make a card using the map stamp, so that was the starting point for my ninth card. I stamped it with MFT Black Licorice Hybrid ink onto a snippet of watercolour paper which I then trimmed down. I added colour by smooshing with Mermaid Lagoon and Wild Honey Distress Oxide inks, as well as Tea Dye Distress ink. I added detail and a sentiment to my islands with more stamping. I then crumpled the paper several times to make it look worn. I gently blended more Tea Dye ink over the crumpled map to highlight the ridges. Then I stamped my card base with Volcano Lake Altenew ink and both sizes of compass from the stamp set to make a tone-on-tone pattern. I added a line of peel offs in mirror brown and finally added the map, to which I’d attached a brad, to the card base. I started my final card by fussy cutting the focal element from one of the patterned papers. I adhered it on foam tape to my card base and tucked the last of the ticket stickers in behind. I then added a sentiment die cut from a snippet of black card. I had so much fun with this kit. I’ll be honest, initially I wasn’t sure it was my style and I thought I might struggle with it a bit, but in the end I really enjoyed it. The cards I made are not as clean and simple as I often go with my projects, but that’s not necessarily a bad thing! I think it can be good to play with other styles from time to time, too. There are still a few of the kits available, so if you’d like your own to play with be sure to go and grab one here. WOW! You’ve been busy!! Thanks so much for joining in the fun at our Double D ‘Watercolor’ challenge! Good Luck and we hope you’ll come back often. So many lovely cards! 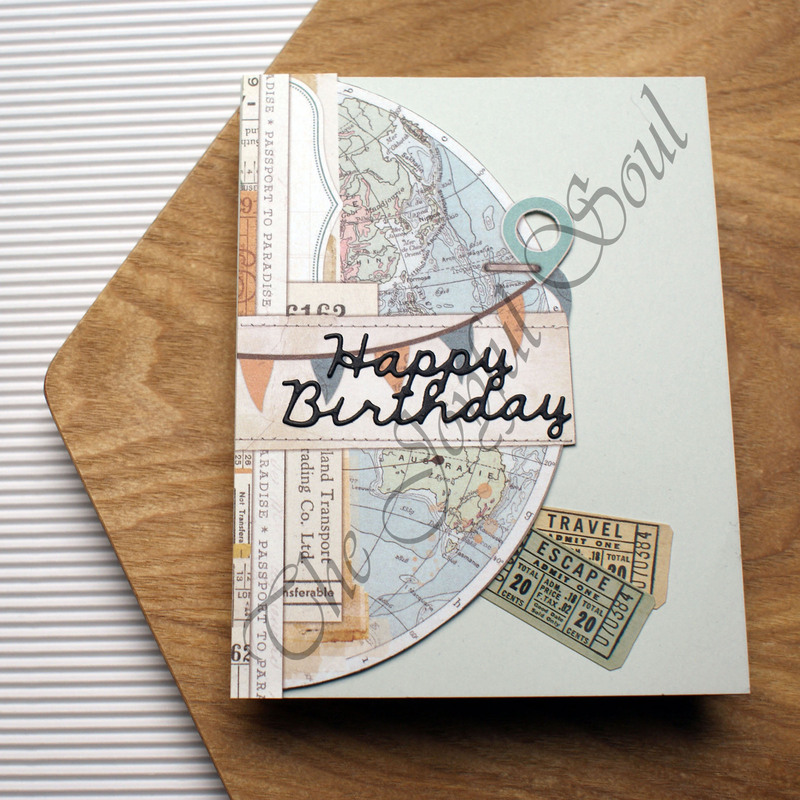 The stamped compass background on the watercolor card is awesome! Thanks for joining our Double D, “Watercolor” Challenge. Love your travel cards. You’ve got a lot talent. We all forget sometimes so don’t worry about it. Wow! So many great cards! Love your color profile and the globe/travel theme in so many of them. Thanks for playing with us at Inkspirational! What a lovely creations! Thank you so much for joining us at Polkadoodles Digi Choosday and best of luck with your entry. So many great cards! Thanks for joining us at Watercooler Wednesday Challenges! Fabulous cards! 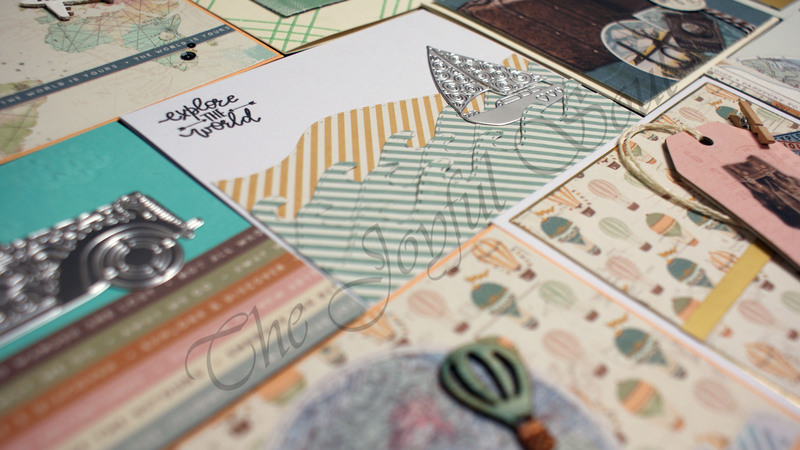 Thanks for joining us for Week 15 at Polkadoodles Crafting Challenge! WOW! So many stunning creations! Thank you for joining us at ATSM! 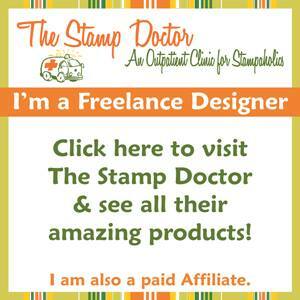 Wonderful work, Thank you for Joining us at Happy Little stampers and waiting to see next time.